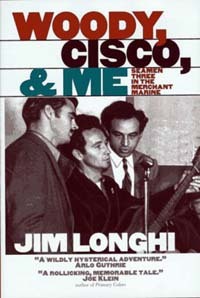 WOODY,CISCO, & ME is a "must read" romp that gives the reader rare insight into World War II experiences in the merchant marine with Woody Guthrie, his folk-singing friend Cisco Houston, and Jim Longhi, who was shamed by Woody and Cisco into joining with them. Brilliantly told—with pathos and salty humor—it is an irresistible story of bravery and hardship, sacrifice and boredom, and life and death, appealing not only to folk music fans but to those interested in tales of World War II adventures as well. JIM LONGHI, in addition to being an author and playwright ("The Lincoln Mask" and "Two Fingers of Pride", a play bound for Broadway with Gary Merrill and Steve McQueen but beaten out by "On the Water Front"), has been a prizefighter. women's hosiery salesman, lawyer, and politician. Still a practicing attorney, he lives in New York.